It's also possible to to record a Time Entry while logged into your Jackrabbit database (without launching the Staff Portal). In order to do this, the user must have a Jackrabbit User ID (not just a Staff Portal Login ID) and have appropriate permissions for that User ID. Login into your Jackrabbit database. Point to Staff in the menu bar, then click List Active Staff. Click the staff member's name. Click the Add Time Entry button. 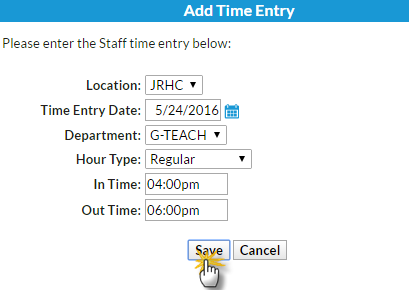 If the staff member has a Manual In/Out or a Clock In/Out time entry method, the Add Time Entry window displays with an In Time and Out Time field. 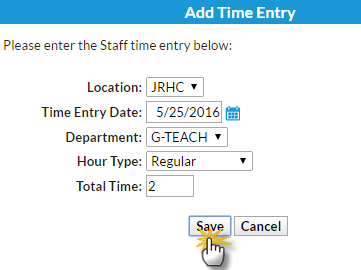 If the staff member has the Total Hours time entry method, the Add Time Entry window will offer a Total Time field. After entering time, be sure to click Save. If prompted, click OK. The entered time will be recorded on the staff member's Time Card tab.